I love my feet. They get me through really busy days. I go hiking on cliffs along the Maine coast; clean up our yard and get to wear the best high heels when we go out to dinner in Boston! But my feet have a dark side. They don't like to be touched by anyone but me. Yes, that's right they are completely anti-social. No there is nothing wrong with them to look at. In fact I think my feet are quite attractive. But they are so ticklish! This makes going out for a pedicure totally impossible. Ten years ago that wasn't a problem. There was a time when girls got together, did their nails and toes and swapped gossip all afternoon long. Then went out dancing and flirting. Well those days are long gone. I can't tell you how many friends call and say Digby, let's go out for manis and pedis. Even brides now take their wedding party out for manicures and pedicures! They seem to love having their feet touched and sharing their secrets in front of strangers. I've hidden my secret for many years because I didn't want people to think I'm weird. No one has guessed my secret because I keep my feet well-groomed and know how to give myself a very professional looking at home pedicure. I use all the right tools for a pedicure. I've found that all good toenail grooming begins with a pair of toenail clippers. If you think that you can get by on the cheap $2.99 toenail clippers from the local big box retailer, well you must be having your pedicure done away from home. Toenails are tough and can be gnarly if you've dropped enough stuff on them over the years - which I have. 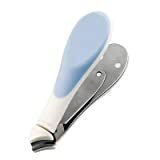 After breaking and warping a fair number of cheap toenail clippers, I gave in a bought an expensive pair the Seki Edge Toenail clippers that were highly recommended by lots of fellow at home pedicure types on Amazon. The first thing I noticed is how good they feel in my hands and that they are quite heavy. That's because they are made from high-quality, twice-tempered stainless steel. Then when you actually use them you'll feel how sharp and crisp the cutting action is. These means far fewer split and cracked toe nails to reshape. 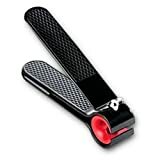 I've also noticed that my husband has started using the Seki Edge Toe Nail Clippers in preference to the cheap tonail trimmers he has in his shaving kit. They give such a nice straight line with a smooth edge that he doesn't have to think about the girly-girly task filing his toenails. He recently figured out my dark little foot problem. After he stopped laughing and trying to tickle me, he was quite supportive. You see all the guys at the VFW Hall seem to think that a gift certificate to the local spa for a pedicure is the perfect wife gift for birthdays and anniversaries. So guess what I started getting! I just kept hiding mine. If he didn't take the time to fill out the TO and FROM lines, I would just regift them. Well, I got sloppy a few weeks ago and just threw a few in the trash. Yep, I got caught. But now at least I won't be getting things I won't use. I did tell him it was okay to go into the spa and buy the hottest nail polish color! I had to laugh while reading this Digby. My feet aren't ticklish, and I love having them massaged. But it took me years to get the courage up to get a pedicure. Strangers messing around with my feet just seemed a little too intimate to me. People have told me that I have really nice toes. However, I've dropped a lot of things on my toes too and my big toenails are really gnarly too. I wonder if we had them removed if they'd grow back smooth? Congrats on your "Editor's Choice Award"! Ha! Fun article, Digby. I, too, am terribly ticklish on my feet. (Now that our secret is out, will we be tortured with tickling when "they" capture us?) I have done pedicures, but it's so embarrassing to be writhing and laughing through the whole process. Like you, I do my own toenails. Great article! Toenail clippers aren't something I had put much thought into, but makes a lot of sense! Thanks for sharing. Eyes can get tired and puffy. Try some of this spa treatments at home to reduce puffiness and minimize bags under eyes. Follow these easy steps to enjoy an amazing mineral milk bath and all it's healthful relaxing benefits all in the comfort of home. Use simple ingredients for yourat home milk bath.